If you are lucky enough to reserve a swim with the dolphins, you will enter the water where you will actually swim and play with the dolphins for 30 minutes with a small group of people. Kissing, hugging, and dancing and the incredible foot push are all part of the activities you will enjoy with your new pals. You will even be able to feed them. 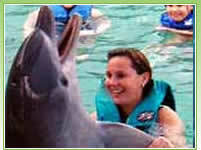 Non-participants may observe those in their party who are swimming with the dolphins. There is an additional $20.00 per observer for the ferry ride from Paradise Island to Blue Lagoon. This observer fee is payable directly to the ferry and no reservations are necessary. Non-participants may observe those in their party who are taking part in a dolphin program. There is an additional $20.00 per observer for the ferry ride from Paradise Island to Blue Lagoon. This observer fee is payable directly to the ferry and no reservations are necessary. The taxi ride to the check-in spot takes about 15 minutes and costs approximately $5 per person each way. Minimum age to participate is 6 years. 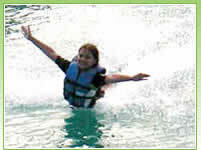 Children ages 6 to 12 must be accompanied by a participating paying adult (parent or guardian at least 18 years or age). Participating adults may supervise up to 3 children. Guests ages 13 to 17 must be accompanied by an adult (observer ticket is accepted) who needs to sign a liability waiver. NO PREGNANT WOMEN ARE ALLOWED IN THIS PROGRAM. DO NOT book the 8:30 program unless your ship arrives at 7:30 am or earlier. DO NOT book the 10:30 program unless your ship departs at 2:30 or later. DO NOT book the 3:30 program unless your ship departs at 7:30 or later. Since most programs sell out, we cannot allow changes in departure time or date. WE GO RAIN OR SHINE! NO REFUNDS FOR BAD WEATHER UNLESS DOLPHIN ENCOUNTERS CANCELS THE PROGRAM. NO REFUNDS IF PERSONS DO NOT MEET REQUIREMENTS OR VIOLATE RESTRICTIONS BELOW.